For those who weren't aware, we posted the first of XCM's new XCM Cross Battle Adapter 2.1. We now have the first exclusive teaser video. There is not a lot to see but its something. In order to use a wireless Xbox 360 controller, you MUST have a Xbox 360 PC Gaming Receiver. The Cross Battle Adapter 2.1 is an adapter for you to connect your WIRELESS Xbox 360™controller to your PS3™/PS3™ Slim console. *NOTE: Xbox 360™ PC Wireless Gaming Receiver must be required. No word on pricing but it will be released soon. You can find this at your usual online retailers such as Play-Asia and Amazon when its available. 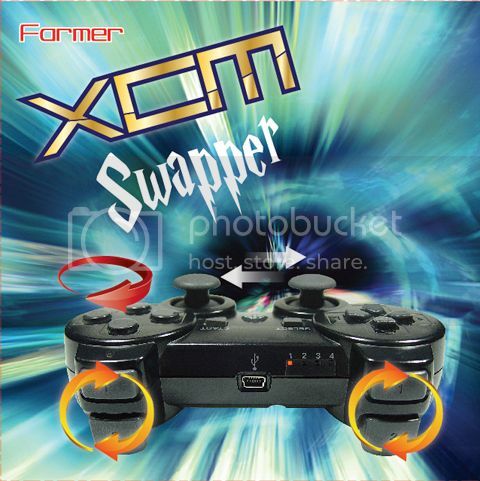 Having posted images of the XCM Swapper for the PlayStation 3, we now have teaser video for XCM Swapper. Anyone plan on picking this up or think this is something that they would get and be helpful? 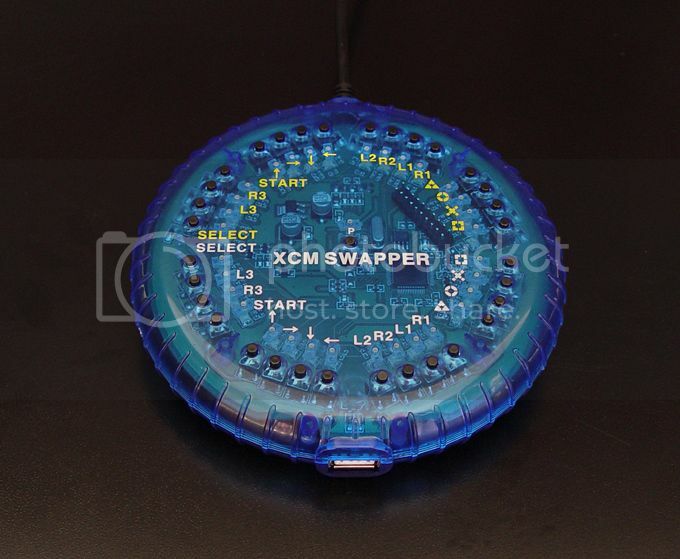 The XCM Swapper will be releasing this month (April 2011) and should retail for around $70.00USD. Play-Asia is taking pre-orders and it will be listed soon on Amazon. We first reported about the XCM Swapper for the PS3 a couple of days ago and we now have actual product shots. The XCM Swapper is the PS3 version of the XCM Re-Mapper for the Xbox 360. Overview : The Kinect Floor Stand is the ideal solution for users without their own tripods. 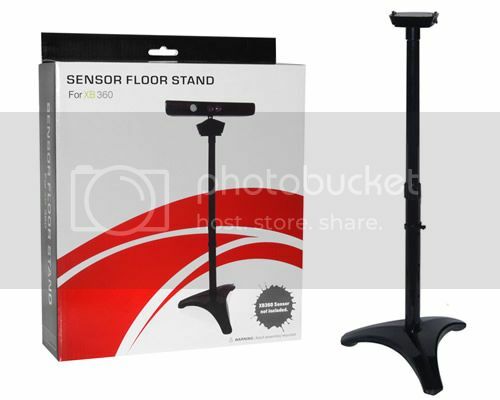 This sturdy, weighted stand supports the Kinect camera on hard or carpeted floors. The camera mounts on at the ideal height for play. The Kinect Floor Stand is perfect for users with large living rooms or those just seeking an easily stored solution. Keeps your XB360 Sensor safe from floor traffic. Secure locking mechanism to keep XB360 Sensor attached. Wide and sturdy base with a sleek piano finish. Quality/Usability : Sometimes, trying to find room on your TV stand, entertainment center or just empty space can be hard to find. With the Xbox 360 Kinect Sensor Floor Stand, there is no need to try and find room since the Kinect sits on the floor stand. 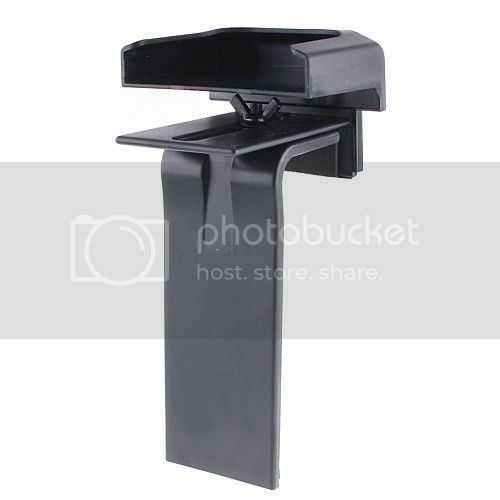 The Xbox 360 Kinect Sensor Floor Stand consists of 4 pieces: base, (2) poles and mount plate. For a floor stand, you would think it would be made out of aluminum or metal. Something to give it some weight and balance. Instead, it is all made out of plastic. You can simply put this all together in less than 5 mins without the need to follow the instructions. On the bottom of the triangle base are three rubber pads. These rubber pads are suppose to keep the stand from moving but don't feel like rubber pads. It has a bit of rubber texture but is smooth and hard...kind of like hard rubber. The poles and base connect to one another and lock into place by twisting (kind of like the caps on medicine bottles or CD spindle cases). Unfortunately, you can not adjust the height of the stand. It stands approximately a little over 2' feet (25" inches). The mounting plates screws onto the top of the pole and the Xbox 360 Kinect goes on top. There are two buttons on the side of the mounting plate that acts as a clamp. This is what holds the Kinect. Although it looks a bit cheap, it does the job of securing the Kinect sensor. 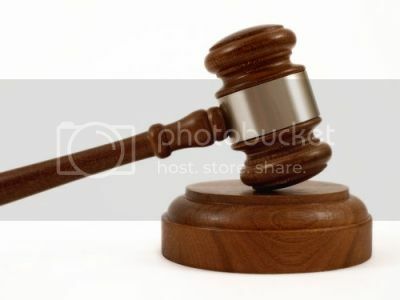 On hardwood floor, the stand is steady. Surprisingly, its sturdy on carpet as well. I thought due to the weight of the Kinect sensor and the very light weight of the floor stand on carpet, that it would wobble. But it didn't. Conclusion : Overall, the Xbox 360 Kinect Sensor Floor Stand worked well. It's very cheap in quality since all the parts were made of plastic. Twisting the poles to lock together didn't feel like it did but still held together. The floor stand worked well on hardwood floor and on carpet. It would have been better if there was some weight to the bottom base itself to give it an anchor. However, the height of the stand is not adjustable. This would of been a nice feature to have rather than a fixed height. If you do not have the floor space or space in front of your TV, you may also want to consider looking into a Kinect Sensor TV Mounting Clip. Overview : The Kinect TV Mount Kit allows users to mount the Kinect camera above flat panel TVs. Quality/Usability : Not everyone has the space to place their Kinect sensor in front of their TV or on their entertainment center. So where is the next best place? On top of their TV of course. Having the Kinect Sensor on top of their TV is the next ideal place since that is where you will be staring at when you're playing. The Kinect TV Mounting Clip sits on top of your TV. Before doing so, you'll need to assemble three plastic pieces. Installation is very simple without even looking at the instructions on the back of the box. It takes no more than 5 mins. All you have to do is take the middle plastic piece that sits on the TV and place the bottom plastic piece, which rests on the back of the TV, underneath the middle piece. You will than insert a screw and washer from the bottom and use the nut from the top to secure both pieces. If you loosen this nut, it allows you to slide the bottom piece close or further away which allows you to adjust how room is needed based on the thickness of your TV. Once both pieces are attached, simply place the top base plastic piece onto the middle plastic piece. This top base is where the Kinect sensor will go into and sit on. On the bottom and middle piece, there is some foam to prevent any damage to your TV and adds friction so that the TV mount does not move. Conclusion : Overall, the Xbox 360 Kinect Sensor TV Mounting Clip does its job of holding your Kinect sensor on top of your TV but there is nothing more it does. There is no need to screw the TV Mounting Clip to the back of the TV and you definitely don't need to move it either. Just simply place it on top of your TV and that's it. This will not fit old-school tube TVs. The price is definitely affordable as its under $9. Installation takes less than 5 mins. Its also perfect if you also own a PlayStation 3 Eye Camera and Mounting Clip since you can have the Kinect Sensor on one side and the PS3 Eye Camera on the other. Don't have room on top of your TV, do you think a Kinect Sensor Floor Stand would benefit you? XCM updates one of their most popular products, Cross Battle Adapter 2.0. Many have asked for Xbox 360 wireless controller support and well...XCM has now incorporated it! For those who don't know what the Cross Battle Adapter is, it allows you to use your Xbox 360 controller on your PS3 console. 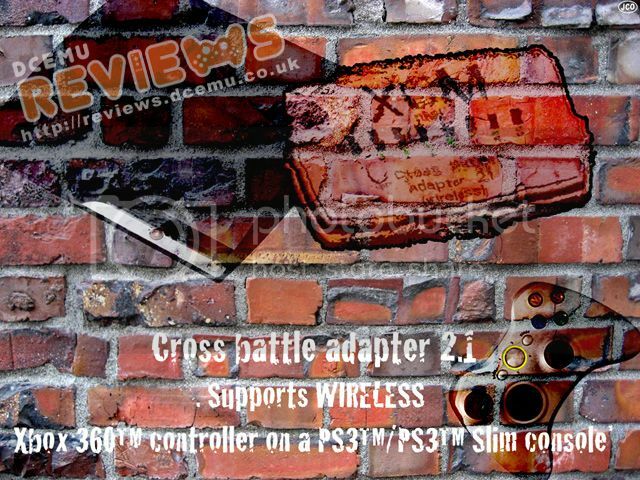 The Cross Battle Adapter 2.1 is an adapter for you to connect your WIRELESS Xbox 360 controller to your PS3™/PS3™ Slim console. **NOTE: WIRED Xbox 360 controller must be required. No Play & Charge Kit. A legal settlement has been reached in the court case between George Hotz (geohotz) and Sony (SCEA). According to the statement issued by Sony, there will be a permanent injunction against George Hotz. Geohotz is not allowed to hack, decrypt, circumvent, etc. any Sony product. Developer ZodTTD, had his Playstation Emulator (PSX4Droid) for Android removed from the Android Market. Why? More than likely because of the launch of Sony's Xperia Play which is Android based and Sony currently has a few PlayStation titles on the Android Market. I wonder who requested it be removed...hmmmm. ZodTTD has decided to host .apk downloads right on his own website and has also made the APP free for anyone to download! I am currently unable to publish to Android Market. In the meantime, I’m exploring 3rd party markets and I have decided to make psx4droid free, based it on the open source software PCSX-ReARMed by Notaz, and made it compliant. What’s new in psx4droid 3.0.0? Well it’s based on a different emulator, PCSX-ReARMed. It has a better dynarec (cpu emulation technique) and lands up being much faster in general. It’s using a software GPU for graphics rendering, though I have an OpenGL ES 1.1 GPU made. OpenGL ES 1.1 is hit or miss for this type of rendering on Android devices. Many of these high end devices have slow Adreno 100 GPUs. So soft GPU is the way to go for now, especially with some improvements to come. psx4droid 3.0.0 should have great compatibility, better performance, though it may be a lil rough around the edges when it comes to the settings panel. If you notice a force close in it, it’s bound to be fixed coming up. Note that all save states previous to 3.0.0 are no longer compatible. If you have quick saves, be sure to turn OFF quick load before running games in 3.0.0. You should save over the quick saves or delete them before turning back on quick load. Wish I could put this up on Android Market. This will just have to due for now. We all know that the Nintendo Wii lacks HD compared to the PlayStation 3 and Xbox 360. We also want to know when Wii2 or WiiHD will be released as we're all drooling at HD. A new product known as the Wii HDMIKey was announced back in March, promising up to 1080p upscaling HDMI output support (we've been lazy and forgot to post this). The dongle connects to the back of the Wii and quite a few features including all region support, HDMI audio output, on screen configuration and many more. Works with all Wii's - all regions, PAL and NTSC! No HDCP or SCMS protection - capture or record game play in high definition! No word on pricing or exact release date. Would you consider purchasing this or wait for Nintendo to release a HD version of the Wii? What are your thoughts?